Offensive coordinator Tim Lester fully takes over the controls of the Syracuse offense this season, installing a simpler offense than his predecessor. It should not be hard for Lester’s scheme to be an improvement over last year’s result, as an injury-riddled unit often had problems scoring, evidenced by the SU offense averaging under 15 points per game. 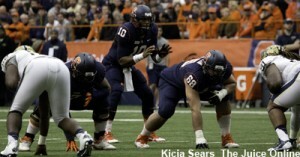 Tim Lester’s first full year running the Orange offense will be Terrel Hunt’s third season at the controls. After suffering a season-ending injury midway through the season, Hunt spent the remainder of the schedule in the coaching box with Lester, trying to get a better understanding of the chess game on the gridiron. Hunt enters the season with over 2,600 passing yards and 800 yards on the ground in his career, as well as 24 touchdowns to his credit. The concern is that 13 of those scores have come on the ground and the remaining 11 touchdown passes are complemented by a dozen interceptions. Austin Wilson is listed as the backup, following a season where he threw 50 passes over the course of five games, but he is joined on the official depth chart by true freshman Eric Dungey. Dungey, who came to the Orange from Oregon, turned some heads during summer camp by dropping hints of some of his potential and stealing some second team reps from Wilson. With any luck, A.J. Long, who played in half a dozen games as a true freshman, including five starts, will be able to redshirt the season to build up his body. Long suffered a broken bone in his right hand over the summer and was only sporadically available in camp. In contrast to the previous few seasons, SU does not have an established running back in the fold, as neither junior Devante McFarlane nor junior George Morris II has racked up 500 yards in two years of play. McFarlane, who brings a 6.1 yards-per-carry average into the season, has shown the ability to make things happen. 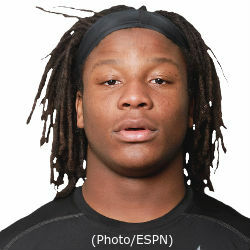 He had an 86-yard run last year to complement a 56-yard scamper as a freshman. Morris II, who rolled up nearly 650 all-purpose yards and had earned a place in the running back rotation as a true freshman, is listed as the backup this season. Freshmen Dontae Strickland and Jordan Fredericks are expected to see some action, as well. One feature of Lester’s offensive scheme is the usage of an H-back, a player who will line up in different parts of the formation and be used in various ways, including taking handoffs and being a featured part of the pass game. The Syracuse fan base started calling the position “the expressback” and the coaching staff has picked up the new name. Ervin Phillips is slotted to start there as a sophomore after being a part of the backfield mix as a freshman. Phillips’ quickness and versatility should make him effective in this role, as he will often get the ball either with momentum or in space with the chance to make things happen. Former wideout Ben Lewis is the backup here. A redshirt junior, Lewis caught 24 passes last season for the Orange, including a touchdown grab against N.C. State. The wide receiver corps is led by a potential star in Steve Ishmael, who grabbed 27 passes as a freshman, including a team-high three touchdown catches. Two of those scores came against Florida State and Ishmael’s 97 yards against Pitt were the third-highest single game mark for an SU receiver on the season. Brisly Estime, who made some big plays two seasons ago as a freshman, suffered through an injury-ravaged season, catching ten passes in five games. Now healthy, Estime is listed as the starter across from Ishmael, having recently passed Alvin Cornelius on the depth chart. Cornelius, a redshirt junior, has snared a dozen passes in two years, including seven against Boston College two seasons ago. Redshirt sophomore Sean Avant will be in the wideout rotation, as will a pair of 6’5” second-year players, Jamal Custis and Adly Enoicy. Avant caught three passes in his first action last season while Custis caught one while appearing in ten games. Enoicy redshirted in 2014. The Orange also have a pack of tight ends to work with, led by Josh Parris, a redshirt junior. Parris has amassed nine starts and 22 catches in 22 games across the last two seasons. Kendall Moore, who has slid from tight end to offensive line and back during his two seasons on the hill (he is listed in this season’s media guide as a center), is listed as the backup to Parris. Cameron MacPherson, a transfer from Georgetown, is now eligible to play after sitting out last season. Two sophomores, Tyler Provo and Trey Dunkelberger, will also be in the mix. Provo is the younger brother of the top receiving tight end in Syracuse history, Nick Provo, while Dunkelberger is a junior college transfer who will have three years of eligibility on campus. The offensive line was decimated by injury last season. While Sean Hickey started all 12 contests last year, he was the lone linchpin of the unit. The offensive line only had its ideal starting five for one game last season, running out seven different starting lineups overall and not having the same starting five for consecutive contests until the fifth and sixth games of the year. Considering the unit the normally demands continuity to the point where the players sit on the bench in the same configuration as they line up on the field, those injuries greatly hindered the SU offensive attack throughout the schedule. The returning group of linemen is comprised of some experienced players (the returning roster features a combined 90 starts at Syracuse) as well as some talented youth. Three players with over 20 starts apiece are entrenched in the starting lineup, led by Rob Trudo, a three-year starter. While all 11 of his starts came at guard last season, he shifts to center for his senior campaign. His left flank will feature tackle Ivan Foy and guard Nick Robinson. Foy (23 starts) comes over from right tackle for his final campaign at SU and Robinson (21 starts) migrates from right guard for his senior season. Junior Omari Palmer, who started nine games last year at three different positions, is slated for the right tackle spot, where he opened half a dozen games last season. The lone new face is senior Seamus Shanley, who will start at right guard. 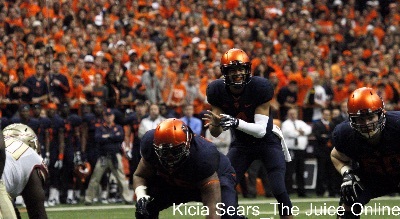 A former walk-on, Shanley has seen very limited action at Syracuse, but beat out redshirt freshman Aaron Roberts, who was the leader at the spot coming out of spring practice. The second string includes four players who were on the two-deep at the end of last year. Junior center Jason Emerich (15 games played, including two starts at center) and senior tackle Michael Lasker (18 games played, one start) bring significant game experience to the second string, but Lasker is coming back from an injury and is not on the depth chart to start the season. As a result, true freshman Cody Conway is listed as the backup to Foy at left tackle. When he returns to full health, Lasker will likely displace Conway. Two sophomores, guard Alex Hayes (three games, one start at right guard as a freshman) and tackle Jamar McGloster (three games), are also on the two-deep. The aforementioned Roberts is listed as the backup at right guard, but is likely behind Hayes at either guard spot.